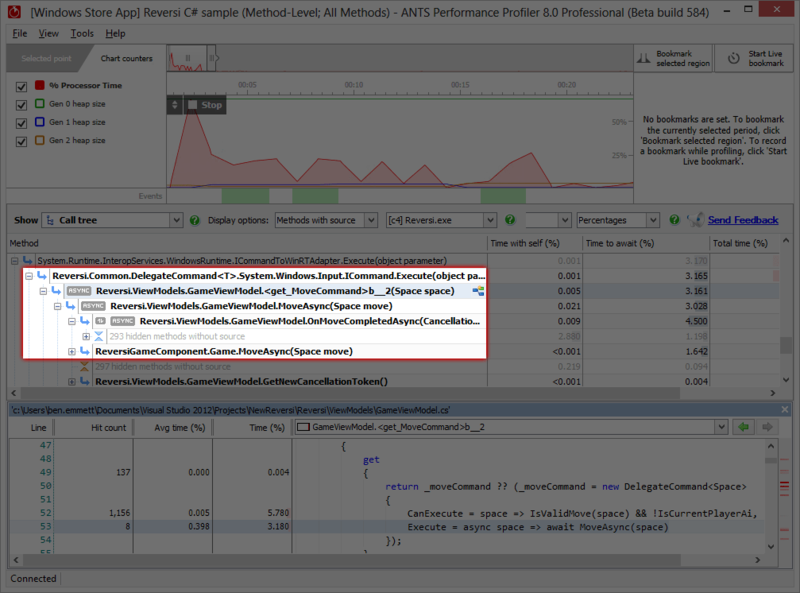 ANTS Performance Profiler is a .NET profiler for desktop, ASP.NET, and ASP.NET MVC applications. 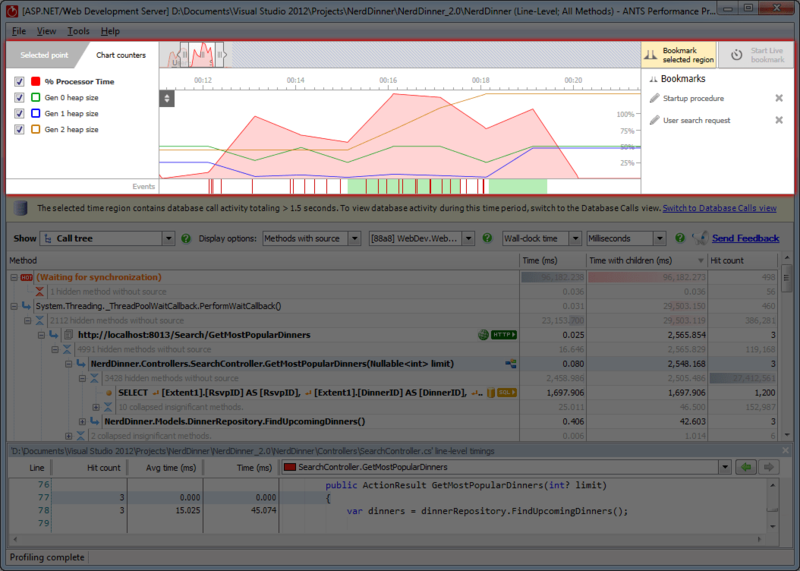 Improve application performance by profiling your own .NET code only. View performance data for both your .NET code and database requests made by the .NET code. Profile database requests your application makes to any SQL Server, Oracle, MySQL (or MariaDB), and PostgreSQL database. This is ideal if you're using an ORM. View rich data about outbound HTTP requests made by your application, including request and response header information. See all the information in the context of the .NET code which caused the request to run. Get comprehensive performance information on your application's disk activity. The call tree in the .NET performance profiler shows you data for every method and identifies the most expensive methods, database queries, and web requests. Profile C# or any other .NET code line by line, with precise timing data so you can find issues at a glance. Expensive lines of code are automatically highlighted for quick visual inspection. Understand how your .NET code makes database queries and how those queries perform. ANTS Performance Profiler supports SQL Server and Oracle databases, whether local or remote. Look at your application's outgoing HTTP requests. Get data about the request and response headers, and see what .NET code caused them to run. 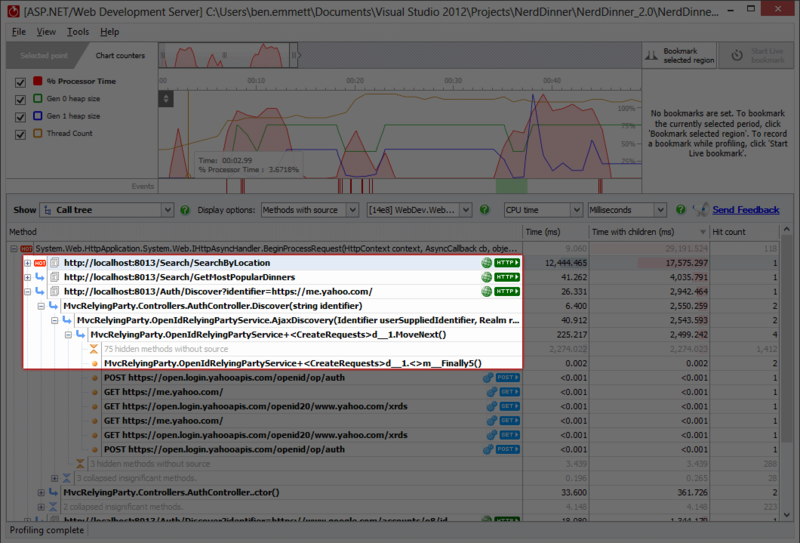 Use the interactive timeline to check the CPU usage of your .NET or ASP.NET application and highlight problem areas to focus only on the data that matters. 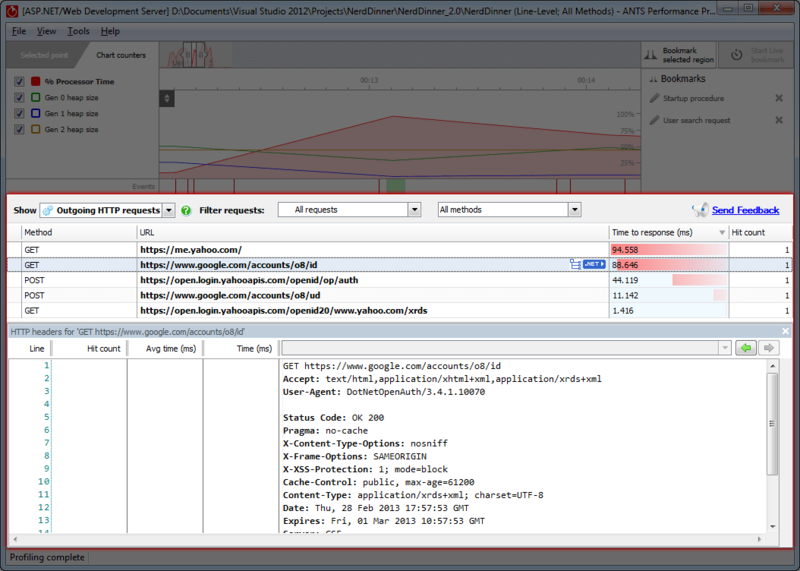 Code and database activity are grouped by HTTP request, exposing performance problems on specific web pages. Understand the performance of C#5 async code. View activity in the context of the code you wrote, and see how work being done asynchronously is related to the async method which caused it to run. Find bottlenecks in third-party components and framework assemblies using integrated decompilation, powered by .NET Reflector. Relate timings for your individual lines of .NET code right through to the SQL execution plans. Find out exactly why your SQL query is running slow. * The Standard edition can only profile methods with source code (i.e. it will not profile Microsoft framework methods or third-party components). It uses PDB files to find out if you have the source code, so you will need the PDB files to see your performance data. “Over the weekend, we rolled out a few speed improvements to the Stack Overflow engine. “I don't know how I ever developed enterprise software without the ANTS profilers. “It's one thing to write software that compiles and "works". It's an entire other ball game to write software that performs and scales. ANTS Profiler can help you achieve that goal in a very big way. “Having been an ANTS Profiler user since the early versions of the product this current release makes my favorite toolset even more powerful. Mitchel Sellers, Microsoft MVP, IowaComputerGurus, Inc.
Windows Forms, ASP.NET Web applications, WPF, Windows services, XBAP, SharePoint and Silverlight 4+. Allows C# profiling, VB.NET profiling, and F# profiling. .NET Core and .NET Standard. .NET 2.0, 3.0, 3.5, 4.0, 4.5, 4.6, 4.7. Compatible with Windows 10, Windows 8, Windows 7, Windows Vista, Windows Server 2008, and Windows Server 2012. IIS Express, IIS 6, IIS 7, IIS7.5, IIS8 and ASP.NET Web Development Server (Cassini). Attach to a running .NET 4 / 4.5 / 4.6 process with no need to restart your target application or website. Compatible with Visual Studio 2010, 2012, 2013, 2015, and 2017. ASP.NET, Azure Web Roles, and Azure SQL Database provide a great way to build highly scalable, data-heavy applications, without having to worry about the underlying infrastructure. In this walkthrough we'll take a look at profiling such an application. Is SQL Server killing your .NET application performance? When a .NET application suffers from performance problems, it's common to assume the database is at fault. 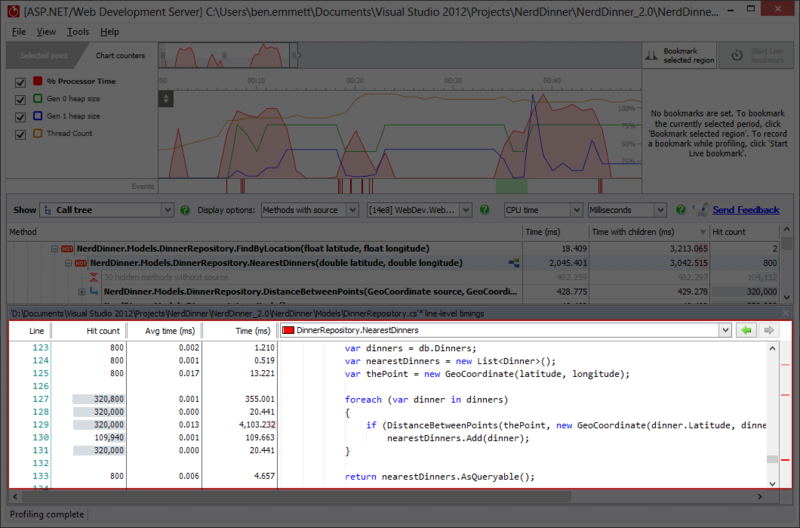 Ben Emmett examines why this often isn't the case, and shows how you can dig into .NET application performance and .NET's use of SQL Server with ANTS Performance Profiler. 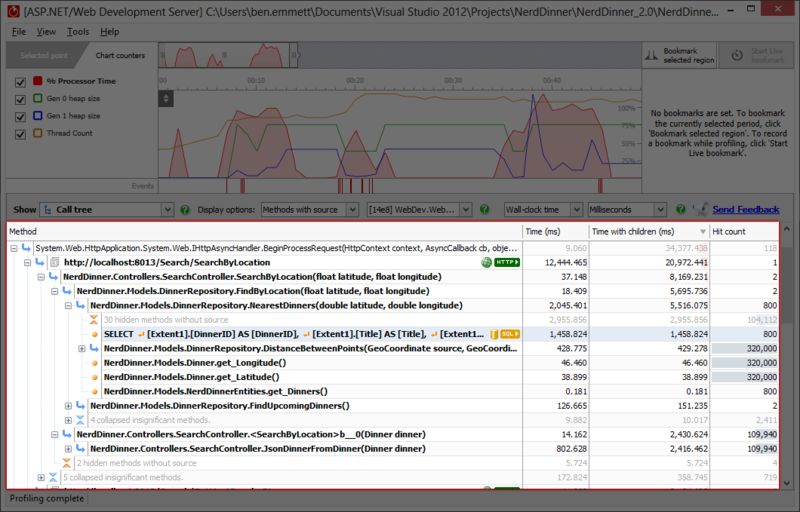 To understand and improve .NET performance, you need to examine every aspect of your code. Bottlenecks sometimes lie in the way your code calls methods in third-party or framework assemblies. In this article, you’ll see how ANTS Performance Profiler can help you find these problems. 6 top tips on the best ways to start optimizing your code, from the .NET community. 9 tips on speeding up the code-side of ASP.NET applications, from the .NET community. 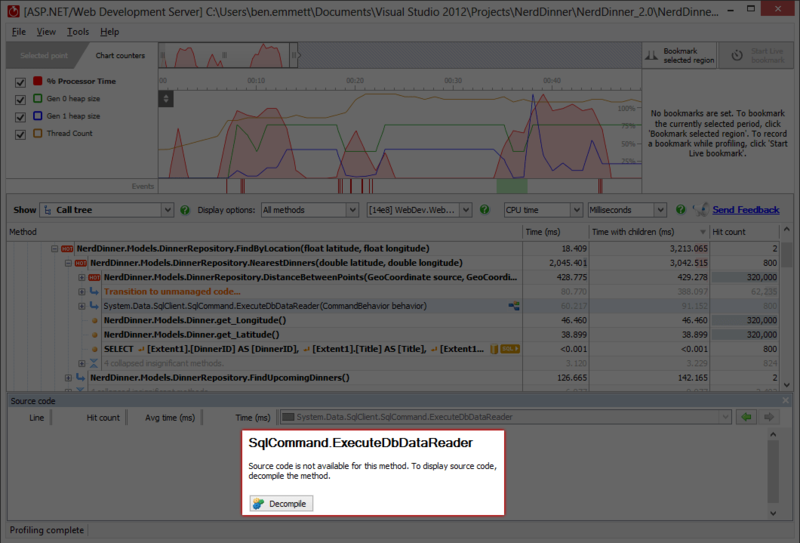 7 tips for avoiding common pitfalls in .NET memory usage, from the .NET community. 11 general tips on improving .NET application performance, from .NET MVPs and other members of the .NET community. 5 advanced code optimization techniques from .NET developer Bartosz Adamczewski. 14 tips on working with SQL Server, Entity Framework, LINQ, and other database technologies, as part of a .NET application. How Graham Russon, IT manager and senior developer at a financial institution in Cape Town, used ANTS Performance Profiler to resolve an urgent crisis with their payment processes. The financial news website Citywire, has high expectations for the speed of their site. A major factor in delivering that speed is finding performance bottlenecks and fixing them. 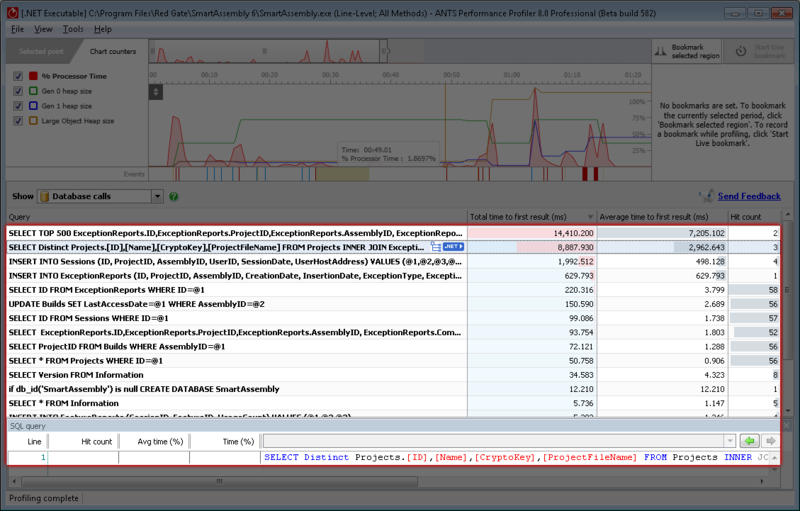 For .NET analysis, Citywire turned to ANTS Performance Profiler. ANTS Performance Profiler technical author Roger Hart demonstrates how you can look at performance information for specific web pages, and get a full understanding of your application's data access. This video walks through profiling Redgate's SmartAssembly tool, showing how information on database queries and web requests can affect performance, as well as how precise code timing data helps you find your application's bottlenecks. Jean-Philippe Gouigoux, Microsoft Certified Professional Developer and Technology Specialist, discusses performance profiling for .NET. This presentation is a must-see for anyone who is new to profiling. Jean-Philippe discusses the basics of profiling in developer-level detail, covers client and server-side profiling, and illustrates classic issues and patterns by demonstrating profiling on a real world application. Before you load your valuable ASP.NET application into a rocket and aim for the cloud, let's do a sanity check. How do you handle bandwidth shortages that never let your app reach orbit? What happens if you need more speed to haul all these users up? If your uptime flames out, how can you easily plan for splashdown? Download a 14-day free trial, and start solving your performance problems.